Tick-related emergency room visits are most common in the spring, when blacklegged tick nymphs are abundant, and fall, when adult blacklegged ticks look for one more meal before winter arrives. 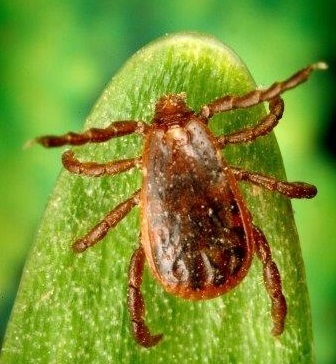 Few ticks are out searching for meals in December, January and February, so tick-related emergency department visits are low during those times. 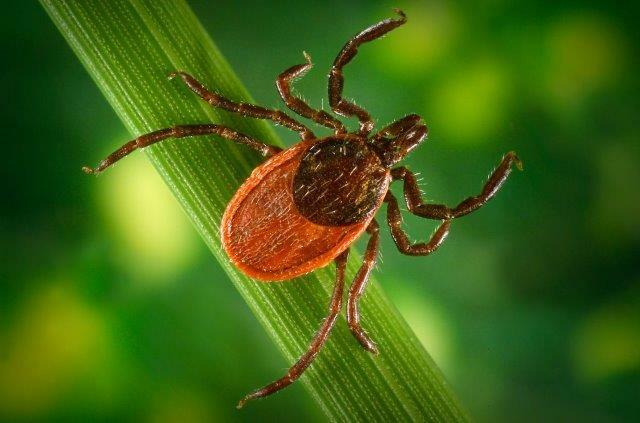 Spring tick activity is associated with increased cases of Lyme disease and anaplasmosis, and Vermonters continue to be at risk for anaplasmosis during the fall months. How was this graph built? The Health Department collaborates with hospitals across the state to collect data on recent emergency room (and some urgent care) visits. Information like the date of the visit, reason for the visit, and diagnosis are analyzed to detect public health events and monitor trends in disease activity. What do all the bars and lines mean? The graph shows the weekly percentage of emergency department visits for tick-related issues. The blue line represents the average percentage of visits due to tick-related issues at that time of year (based on 2004-2016 data). The orange line represents the highest percentage of tick-related visits that has been recorded at that time of year. The green bars show the percentage of visits due to tick-related issues in the current year. Protect, Check, Remove and Watch. Visit our Prevent Tick Bite & Tickborne Diseases webpage to learn how to prevent and respond to tick bites. Thirteen different species of tick have been identified in Vermont. Get the full list of tick species. Of these 13 species, five are known to bite humans and four of those five can transmit diseases. However, over 99% of all tickborne diseases reported to the Vermont Department of Health are caused by only one tick: the blacklegged tick. Active: In Vermont, blacklegged ticks usually become active in late March or early April after laying low during the cold winter months. Their peak activity typically occurs in May and June when nymphal ticks are looking for a host. Tick activity increases again in October and November when adult ticks are looking for another host before cold winter temperatures set in. Although blacklegged tick activity typically follows this pattern, it is important to note that these ticks might be encountered at any time of year when the temperature is above freezing. How common are disease-carrying blacklegged ticks in Vermont? The Vermont Department of Health collaborated with the Vermont Agency of Agriculture and Lyndon State College to learn how many of Vermont's blacklegged ticks carry pathogens that can cause disease. Over 2,000 ticks were collected and tested between 2013 and 2016. Over 60% of the ticks collected as part of this initiative tested positive for at least one disease. A small sample of these ticks was also tested for Powassan virus. Approximately, 1% tested positive. Blacklegged ticks can carry more than one pathogen at the same time. Almost 5% of the ticks tested positive for two or more pathogens. The most common combination (4.0%) was the pathogens that cause anaplasmosis and Lyme disease. 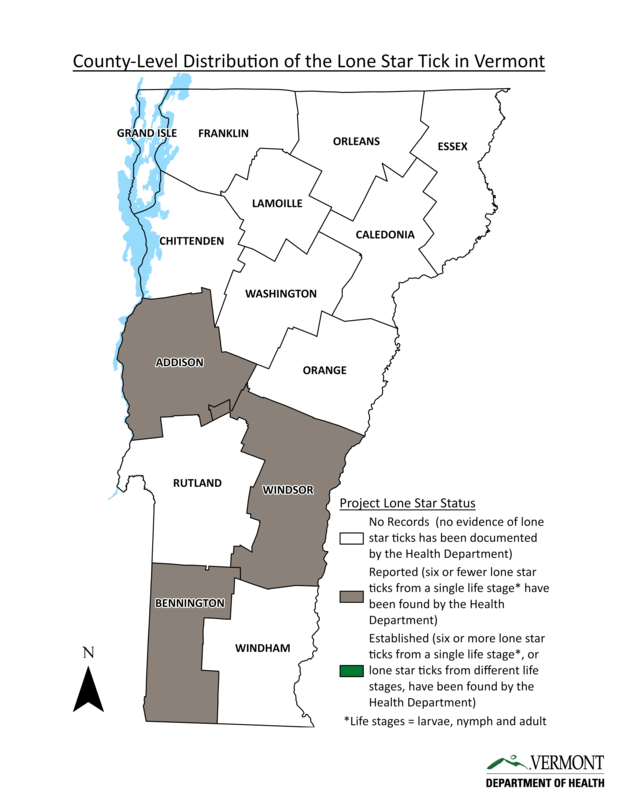 The Health Department works with other state agencies to search for the lone star tick in Vermont and support people with information to protect themselves. Hosts: feeds on squirrels, raccoons, deer, cattle, some bird species, cats, dogs and humans. Active: April through September. While most ticks wait in grass or brush to grab on to people or animals who pass by (questing), lone star ticks also actively track down a host by following the trail of air the host breathes out. Spot a tick? Share information about where and what kind of ticks you found.